A crotal is any hollow, enclosed object that contains a hard pellet trapped inside and has one or more throats (slits) that allow the object to vibrate and create sound. The sound is produced when the pellet rolls and bounces freely inside the object. Technically, a crotal is really a rattle, not a bell, since it is sounded by a loose pellet, not a swinging clapper. Photo: This basic crotal has a shank (upper left), four large holes in the base (middle left), and a ridge or rim around its middle. It also has one throat (lower right) with traditional rounded openings at each end. A typical crotal made by North American and British manufacturers is made of brass or bronze. It has one or more throats (slits) cast or cut into the outer half of the bell. A throat may have a rounded opening at each end. These openings, besides looking attractive, may reduce stress cracks that often start at the ends of the throat. The pellet inside a crotal, also called a jinglet or pea, is usually a small ball of iron or mild steel, although the pellet is sometimes a smooth pebble. There may be a ridge or rim encircling the middle of the bell. In very old bells, this ridge is where the two halves of the bell were joined together by crimping, soldering or brazing. In traditional one-piece cast bells made since the 1500s, the ridge is a design element that marks where the two halves of the mold matched up. Most crotals have two to four holes cast into the lower half. These holes are often incorrectly called "sound holes", but the holes are really required to manufacture the bells, not for the bells to produce sound. The base of the crotal will also have some kind of loop, bar of metal, or hole. This feature allows the crotal to be attached to a leather or cloth strap, a rope or chain, or a metal or wood bracket. The oldest way to make a crotal is to form each half of the bell as a separate piece. Each half of the bell is made by cutting and hand-forming sheet metal or by casting molten metal into the appropriate shape. The jinglet is inserted into one half, then the halves are crimped, soldered or brazed together to form a single bell with the jinglet trapped inside. The labor intensive method of forming and assembling two-piece crotals was eventually simplified by an ingenious method that allowed a crotal to be cast in one piece. Since no soldering or crimping is required, a one-piece crotal can be made more quickly and for less cost. William Barton of East Hampton, Connecticut, is often given credit for having developed this technique about 1810 (1). This story is incorrect, however, since one-piece crotals were made as early as the 1500s, according to archaeological research in the UK (2). This one-piece method requires two molds made of molding sand: an inner, more-or-less-spherical "core" in which the pellet is embedded and an outer form that contains a spherical cavity slightly larger than the inner core. When the core is inserted into the cavity of the outer form, the internal core is accurately centered the cavity by protrusions of sand in the outer form. These protrusions will form the throat and holes of the bell when it is cast. The slight gap between the core and the outer form creates the wall of the bell when molten metal is poured into the assembled mold. The outer form also contains a sprue hole, the opening through which the molten metal is poured during casting. Metal that hardens in the sprue hole is called the "sprue." The sprue on the oldest style of sleigh bells was neatly trimmed to form a tab -- or shank -- of brass protruding from the base of the bell. A hole is either cast or drilled through this shank. A wire is threaded through the hole to attach the bell to a strap. The sprue was entirely removed from some bells introduced in the 1860s. A hole was drilled or punched through the base of this type of bell. A rivet or screw was used to attach the bell to its strap. After the newly cast bell is removed from the outer mold, the loose sand is removed from the inside and outside of the bell. 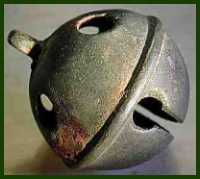 Some bells were sold with the rough, pebbly finish created by the sand casting process. Most bells were smoothed and polished before sale. 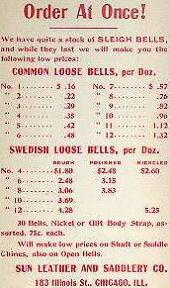 Some manufacturers used lathes to turn a smooth finish on their bells. Faint circular marks are a telltale sign of this labor-intensive step. Other bells were tumbled in barrels of sand to smooth and polish the surface. Some bells were then plated with nickel or chrome for protection and to change the color to a fashionable silver. Bells with different finishes were priced according to the amount of work involved (below). 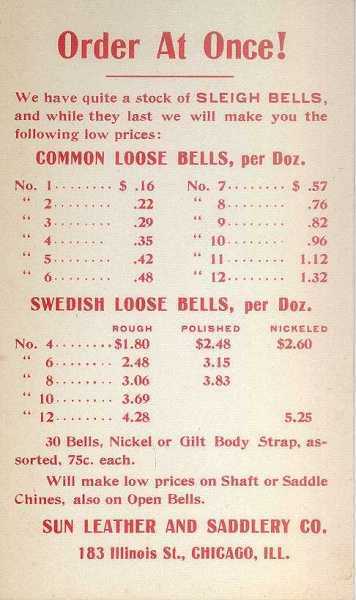 This vintage advertisement lists the different grades (rough, polished, nickeled) of bells available and the prices for same. This card was mailed in December 1903 to a Minnesota customer. Click on the image to see a larger version.